Gotham Comedy Club :: A Special Valentine's Day Show with The Gotham All-Stars! 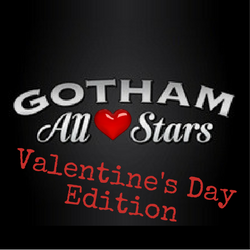 A Special Valentine's Day Show with The Gotham All-Stars! Featuring Marion Grodin, James Goff, Jon Fisch, Veronica Mosey and Jared Freid! Already striking at almost six feet tall with red hair, Veronica Mosey has earned a solid reputation as a comic with both a tremendous stage presence and the ability to engage all kinds of audiences with her impressions of celebrities as well as everyday characters. Her material is thought-provoking; her demeanor fiery yet likable. She earned the title of one of "Five Comics to Watch" by Rolling Stone Magazine, as well as appearances on Comedy Central, HBO, Vh1, The Tonight Show with Jay Leno, Fox News, The Dr. Phil Show, TBS and more. She was a contributing joke writer for Jerry Seinfeld's The Marriage Ref and was a featured comic on Lie Detectors on the Game Show Network. She is one of only a handful of female comics working regularly at all of the top comedy clubs in the country and New York City including the prestigious Comedy Cellar, Stand Up New York and Gotham Comedy Club. She has performed internationally in major cities such as Montreal, Canada, Melbourne, Australia and at the Stockholm Comedy Festival in Sweden. Her sarcastic wit has been published in Us Weekly Magazine's Fashion Police as well as the New York Post.